Father Brown is an eccentric priest with his own particular ways of dealing with crime. 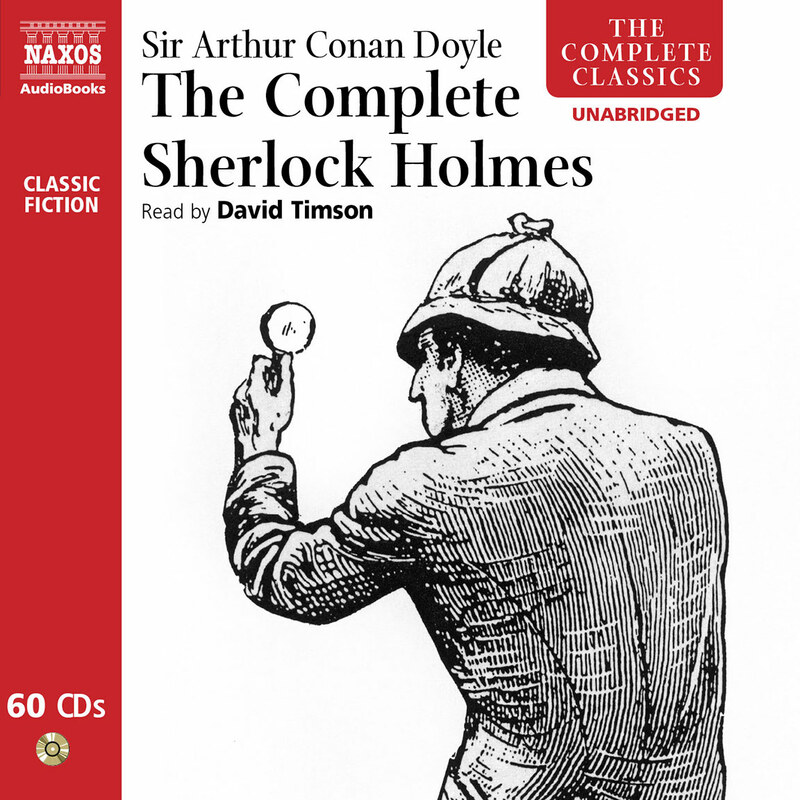 David Timson, having completed the whole of Arthur Conan Doyle’s Sherlock Holmes canon – a remarkable achievement – turns his hand to the genial but certainly not innocent priest! 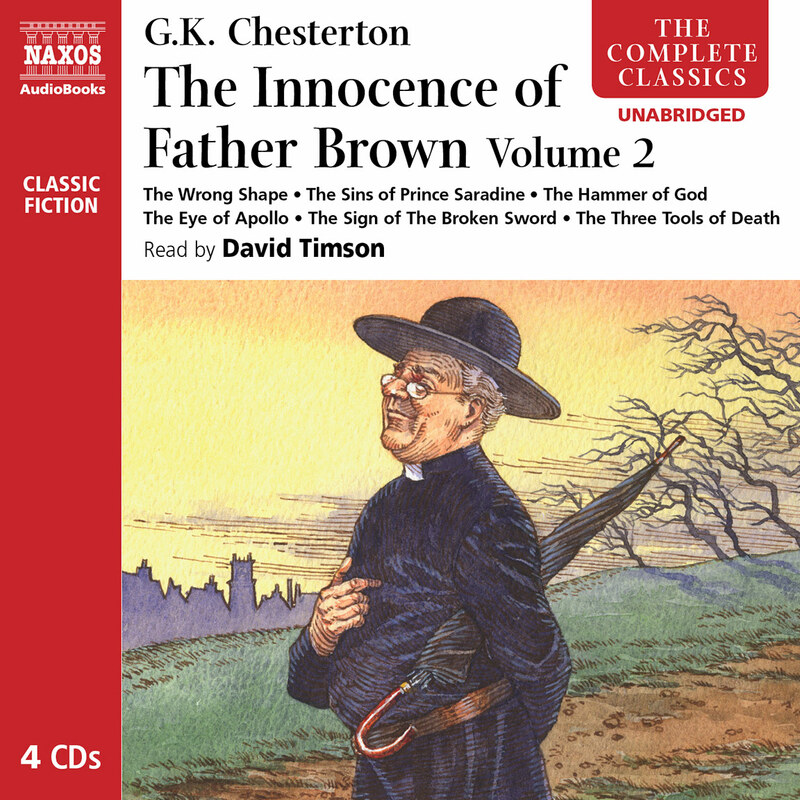 This collection contains a group of stories from the Innocence of Father Brown, told unabridged. 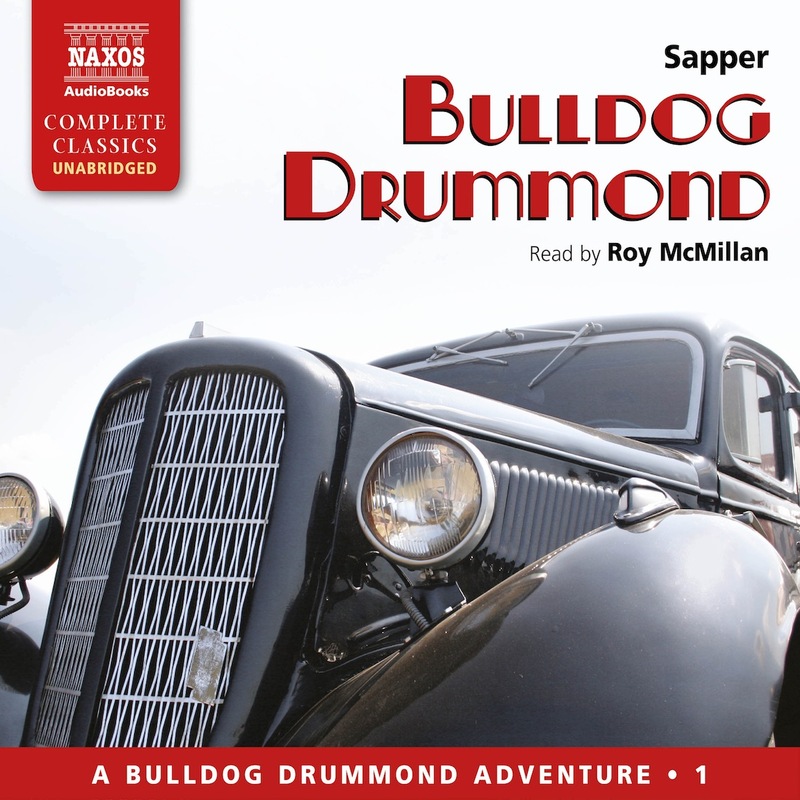 David Timson is one of those audio-book readers who, rather than giving a “signature” performance like some of the big stars of the genre, simply inhabits and projects his subjects with a delicate empathy, so it’s the book and its characters that linger in the mind. 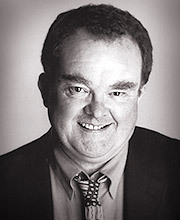 Which makes him an excellent choice for G.K. Chesterton’s tales of the unassuming Catholic priest who claims that his work at the confessional (where he has to do “next to nothing but hear men’s real sins”) puts him in an excellent position to solve the bizarre crimes that come his way in pre-first-world-war England. Chesterton’s prose can be as ostentatiously extravagant as an Edwardian grandee’s moustache, and is marred by a breezy anti-semitism. This, though, does not seem to be shared by the unassuming cleric, whose humble conviction that his God will eventually triumph over the souls of even the most evil of criminals is the quiet but insistent heartbeat of these unusual exercises in detective fiction. Great detectives in printed fiction (forget about those created for television) are sometimes hard to tell apart. Sherlock Holmes is unmistakable, but he might be mistaken for Poe’s Dupin of The Murders in the Rue Morgue by one unfamiliar with both. Nero Wolfe is unique, seldom leaving his office and depending on reports from his assistant. Another one-of-a-kind sleuth is the Catholic priest, Father Brown. He appeared for the first time in 1911 from the pen (or typewriter) of G.K. Chesterton. Unlike other detectives being invented at that time, he does not look so much at clues as at the way people act. Being a priest, he has heard enough confessions to give him an insight into the thinking patterns of criminals. Of course, Chesterton is careful to supply enough information for his character to put the pieces together, sometimes beyond the bounds of reason. For example, in one tale Brown prevents a crime by analyzing the pattern made by a series of footsteps outside a door! In another, he realizes that because a man is found with an arrow in his back, it did not have to come from a bow. And so on. Religious matters are used only to further the plot, not to convert a character or the reader. 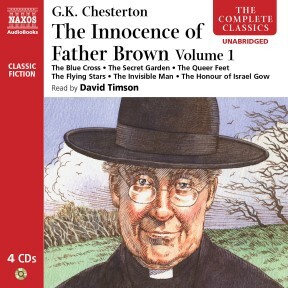 So at present, I am having a wonderful time listening to two Naxos boxed AudioBooks titled The Innocence of Father Brown, Volumes 1 and 2 respectively. The first includes unabridged readings of The Blue Cross, The Secret Garden, The Queer Feet, The Flying Stars, The Invisible Man, and The Honour of Israel Gow. The second holds The Wrong Shape, The Sins of Prince Saradine, The Hammer of God, The Eye of Apollo, The Sign of the Broken Sword, and The Three Tools of Death. Each is as much fun as the title, with added spice provided by the master thief (soon to reform and become a detective) Flambeau and the intrepid (but soon to go too far) French detective Valentine. 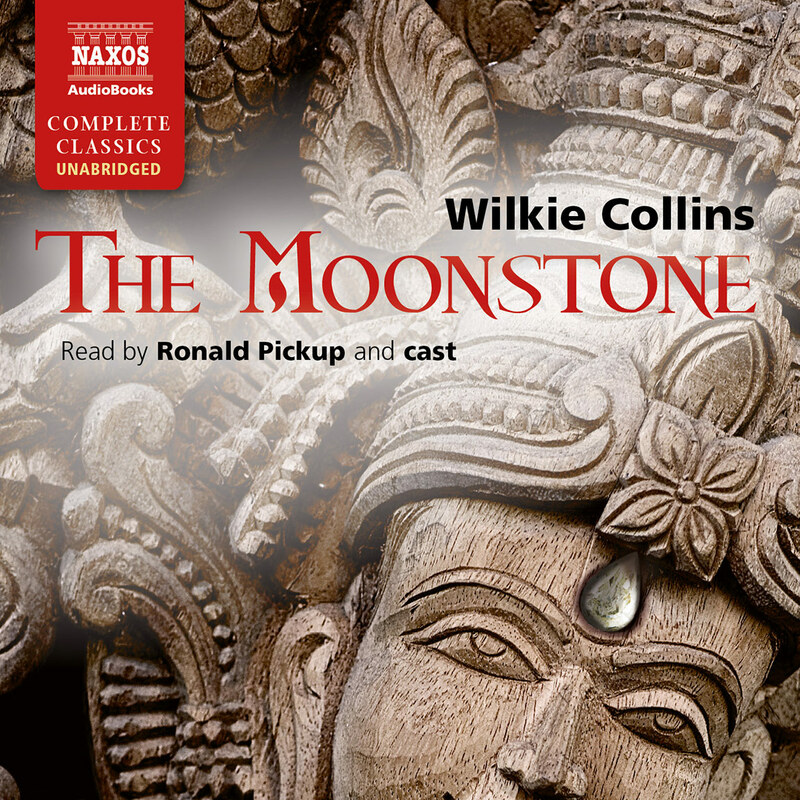 But in such recordings, much depends on the reader; and here, veteran Naxos narrator David Timson does his usual splendid job in keeping the pace moving and the listener riveted. G.K. Chesterton’s ‘Father Brown’ stories were written in the first great age of detective fiction when the market was flooded with imitations of that great prototype of fictional detectives, Sherlock Holmes, created by Arthur Conan Doyle in 1887. Father Brown is, however, no pale imitation; whereas Holmes is given an imposing physique and strong facial features that reflect his unusual intellect and impress the reader with his aptness for the job of detecting, Father Brown is significantly unmemorable. Small, with no distinguishing features but a singularly blank moon-face, he is clad in the anonymous dress of the Catholic priest. No magnifying glass, deerstalker or pipe accompanies him on his adventures, just a pair of spectacles and a large, old umbrella. Yet more by intuition than deduction, Father Brown solves the most seemingly impossible conundrums and crimes that comprise the 52 short stories in which he appears. And, in complete contrast to Holmes’s procedures, he has more use for philosophy than science in his investigations. First and foremost Brown is a priest, and it is his parochial experiences that have helped him to develop his detective skills. Listening to the secret confessions of his parishioners has given him a unique insight into the extent and diversity of human evil. This knowledge, combined with reasoning and observation, is the core of his method, and the stories always end with a rational explanation, revealed by the self-effacing priest. His ultimate belief in the spiritual power of God will not let him accept superstitious explanations. ‘Superstition is irreligious,’ he says in The Wrong Shape. The supernatural is, to him, the greatest reason of all. Father Brown is a philosophical detective, an educated cleric who has arrived at his faith from a rational and intellectual viewpoint, very much like his creator, G.K. Chesterton, who based the character on Father John O’Connor (1870–1952), a parish priest in Bradford who was involved in Chesterton’s conversion to Catholicism in 1922. First published in 1911 in The Innocence of Father Brown, the Father Brown stories do not depend on the reality of time and place, and before one can enjoy them to the full it is necessary to understand the strange and eccentric world of G.K. Chesterton’s imagination. As a writer, he is a Romantic realist and his realism is embodied in fantasy; he is always willing to accept the idea of the improbable, such as a hardened criminal like Flambeau, whom we meet in the first story, The Blue Cross, becoming a detective. Chesterton imaginatively transforms the dull and commonplace into the surreal and exotic. Madness is a recurrent theme and humour an ever-present thread expressed by irony, paradox and the surprise ending. However bizarre or obscure the location, Chesterton reveals that the power and influence of the Catholic Church is ever-present in the kindly but shrewd person of Father Brown. Facts and clues do not abound in these stories; it is the criminal’s motivation and state of mind, and Father Brown’s sympathetic response to him, that interests Chesterton more. These almost metaphysical excursions into crime fiction make them unique in the genre. In this, the first Father Brown story, Hampstead Heath on a stormy day is transformed by Chesterton’s brilliant and lurid description of the sky, creating a surreal background to this tale of pursuit. Chesterton had studied art at the Slade School of Art before turning to writing, and his vivid and detailed descriptions of the landscape in these stories shows his keen artistic eye. This story is unique among the Father Brown mysteries in that it does not follow the actions of the priest himself, who is here the pursued, but rather those of the French detective Valentin, the pursuer. At a party, a decapitated body is found in a sealed garden – where is the murderer? A cleverly constructed crime that verges on being a perfect work of art and in which the medium is blood, this is a tale in the French grand guignol tradition, set in Paris, with echoes of Edgar Allan Poe. The Club of the Twelve True Fishermen in this story would not have been remarkable in its eccentricity in the London of the early 1900s when clubs like The Travellers – the qualification for membership of which stipulated that members must have travelled out of the British Isles to a distance of at least 500 miles from London in a straight line – really did exist. Chesterton was a clubbable man and a founder member of The Detective Club in 1929. In his novel The Club of Queer Trades, prospective members are required to devise a completely new means of earning a living for themselves. In this story the club’s ceremonial fish knives and forks are inexplicably stolen from under the very noses of its members. Father Brown averts a crime and perhaps saves a soul merely by listening to a few footsteps in a passage. This story is set in a prosaic family house in Putney at Christmas, when the theft of valuable jewels takes place whilst an elaborate charade or game of hide and seek is acted out. A Christmas conundrum for Father Brown, in which Chesterton has fun depicting the left-wing John Crook as a socialist (in ‘an aggressive red tie’). ‘A socialist,’ says Crook, ‘means a man who wants all the chimneys swept and all the chimney sweeps paid for it.’ ‘But who won’t allow you,’ put in the priest in a low voice, ‘to own your own soot.’ Chesterton had himself flirted with socialism as a young man, befriending George Bernard Shaw. He later changed his mind on this issue, but kept Shaw’s friendship for life; indeed, Shaw went so far as to describe Chesterton as a ‘colossal genius’. The mundane North London suburb of Camden Town in winter is enlivened by the murder of an inventor by a seemingly invisible man. The body is found surrounded by the inventor’s grotesque robot figures – were they involved in some way in the killing? This story shows Flambeau in his first outing as a reformed man, ironically plying the profession of detective. The mild and insignificant Father Brown is on hand to help him. Set in the wilds of Scotland, at gothic Glengyle Castle, this is a story that could be based on an old party-trick: how to link together a group of disconnected objects. In this instance they include snuff, steel springs, microscopic metal wheels, loose precious stones, and candles without any holders. ‘Ten false philosophies will fit the universe; ten false theories will fit Glengyle Castle,’ says Father Brown at the beginning of this ‘investigation without a crime’! Gilbert Keith Chesterton was a gifted and versatile writer and poet, although he always referred to himself as a mere ‘rollicking journalist’. Chesterton was born in London on 29 May 1874. He was educated at St Paul’s School, where he read voraciously, impressed his teachers with his original thinking, and eschewed any athletic activity. He had a habit of drawing and doodling over his school-books, so on leaving St Paul’s in 1892 he studied art at the Slade School of Art. Here he found a lack of application in draughtsmanship, but there was no sign of it when it came to writing. He had, since his schooldays, written poetry, and during his time at art school continued to write avidly, even contributing some art reviews to The Bookman. In 1900, turning his back on art, Chesterton took the plunge into journalism, and his consequent rise to literary fame was rapid. In 1901 he was asked to write a monograph on Robert Browning, which was followed by a second on Charles Dickens. Both are remarkable for the exuberance of their style and portraiture, and in the case of the Dickens did a great deal to elevate Dickens’s reputation at a time when he was not yet accepted as a notable literary writer. Chesterton had a great empathy with Dickens, whose sense of fun and romance in his writing matched his own. He married Frances Blogg in June 1900 and she was to prove a most supportive wife, in sympathy with the philosophical struggles which had troubled him as a young man. Chesterton also formed a strong attachment at this time to the writer Hilaire Belloc, who became his closest friend. They were similar in temperament and intellect, collaborating on many books. Belloc was a committed Catholic and under his influence Chesterton gradually found, in the Roman Catholic faith, the answers to the dilemmas and paradoxes he saw in life. The Father Brown stories first appeared in the Saturday Evening Post and the first collection, The Innocence of Father Brown, was published in 1911 to great critical success. There are very few areas of literary output that Chesterton did not explore: he wrote essays, criticisms, religious controversy, political polemic, biography, fiction, and poetry. Though sometimes criticised for being didactic, his work is, however, characterised by a vitality, humour, imagination, pugnacity, and sense of romance that constitutes a really good read. Gilbert Keith Chesterton died on the 14 June 1936, at his home in Beaconsfield, Buckinghamshire.